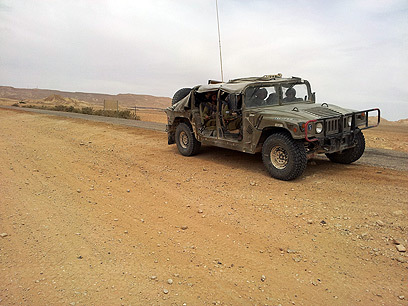 Another serious incident on southern border: An Israeli soldier was killed and another was lightly to moderately injured when terrorists in the Sinai Peninsula opened fire on an IDF patrol in the Mount Sagi area, on the Israel-Egypt border, at around noon Friday. Heavy exchanges of fire ensued, during which the terrorists were killed. According to an initial investigation, three terrorists approached the border with Israel near the Carmit outpost, situated south of Mount Sagi, at a point where the border fence remains incomplete. The terrorists were equipped with explosive belts and assault rifles. The three opened fire on Artillery Corps soldiers who were securing civilians building the new border fence. Soldiers from the Caracal Battalion, in which both male and female combat soldiers serve, rushed to the scene and killed the terrorists, but not before a large explosive device the terrorists were carrying was detonated. The terrorists were also carrying a rocket-propelled grenade, the army said. The Caracal Battalion soldiers were scouring the area for African infiltrators when they were alerted to the scene. IDF Spokesperson Yoav Mordechai said the forces "thwarted a major terror attack that was supposed to take place in Israeli territory. The terrorists were carrying a powerful explosive device." The army has yet to determine whether the terrorists came from Gaza or whether they belonged to the Global Jihad organization, which operates in Sinai. A security source in Sinai estimated that the three terrorists killed in the attack belonged to the Mujahideen Shura Council organization, which is active in Sinai, or to Palestinian organization Ansar Beit al-Makdas, Egyptian newspaper al-Youm al-Saba'a reports. The two organizations are affiliated with the global Islamic Jihad organization and the Salafi movement of Islam. According to the source, three other gunmen were injured in the attack and the area is being combed to locate the bodies and injured on the Egyptian side and find other activists involved in the attack. Egyptian newspaper al-Shuruk reported that Egypt had raised its alert level on the Israeli border following the attack. According to the report, the Egyptian security forces were searching for additional suspects in the area. Security sources in Egypt said they were working in coordination with Israel. So far the Defense Ministry has completed the construction of 210 kilometers (130 miles) of the new border fence. The final segment of the fence, in the Carmit sector, has yet to be completed, in part due to the mountainous terrain. The last segment of the fence is expected to be completed in early November. The southern border has seen a number of major terror attacks over the past few months. In August terrorists infiltrated Israel from Sinai with using an armored vehicle they had seized while killing 16 Egyptian soldiers at a base near the Rafah crossing. IDF forces killed the terrorists. The IDF has identified extensive terrorist activity in Sinai. 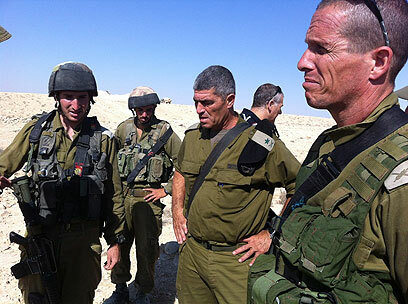 Most of the activity is initiated by terrorists from Gaza, the army claims. However, the security establishment says the Salafi movement, which is behind the Islamization of Sinai, is heavily influencing young Bedouin tribesmen in the region. In June terrorists launched an anti-tank missile at a convoy of construction workers building the security fence along the vast Israel-Egypt border. One Israeli civilian and two terrorists were killed in the incident. Over the past few months terrorists in Sinai launched rockets at Eilat and the border region on a number of occasions, but no Israelis were injured. See all talkbacks "IDF soldier killed in terrorist attack on Egypt border "